Where did they get those design cues from? Hey good lookin', what have you got wirelessly broadcasting? 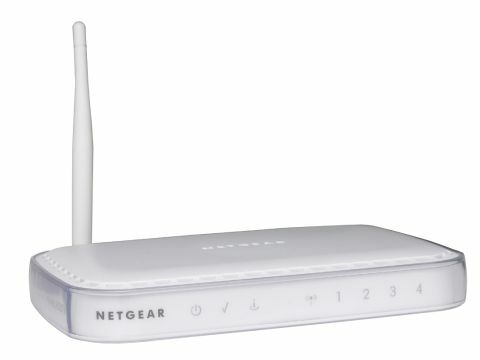 At an excellent price there's future proof, high-speed wireless ADSL2 technology to be had here from Netgear. There are many parallels between this superb home router and the equivalent Linksys WAG354G model. Both are tried and tested routers that have the ability to sit at the centre of your network for several years to come - providing you're not planning on upgrading to 802.11n. Like the Linksys, the Netgear has been through several revisions and, again like the Linksys, it was less stable than later versions of the firmware suggest; it's considerably more reliable than the first-generation silver model, which was also 802.11b and g compatible. That model reviewed extremely well, but long-term testing resulted in signal drops. This is Netgear's best-selling product. No surprise really: not only is the DG834G a breeze to set up, but it's also available at an excellent price. Usually it's around £70, but sometimes you'll find it at £60 or so. Beware though, since some of the cheaper versions can be slightly earlier models - version 2 as opposed to this latest version 3. You can still update the firmware slightly, but not to the level of version 3 as it has a completely different chipset. The latest version has other future proofing such as ADSL 2 support and the ability to connect via a VPN. The browser based configuration page is the only thing that's showing signs of age; it isn't as intuitive to change settings as some of the other now available.